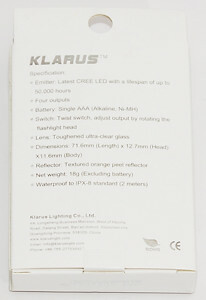 Klarus is one of the newer flashlight companies, but they already have a number of lights, both in aluminium and stainless steel. 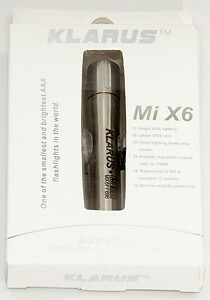 This is the second stainless steel keychain light Klarus have made, the first was Mi10. This light is an AAA light with 3 levels and strobe. The user interface is the usual AAA interface with tighten and loosing of the head. 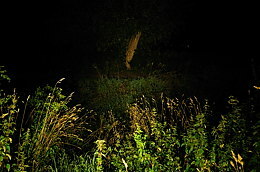 The light always starts at medium and has a medium-low-high-strobe sequence. The light is made in stainless steel. 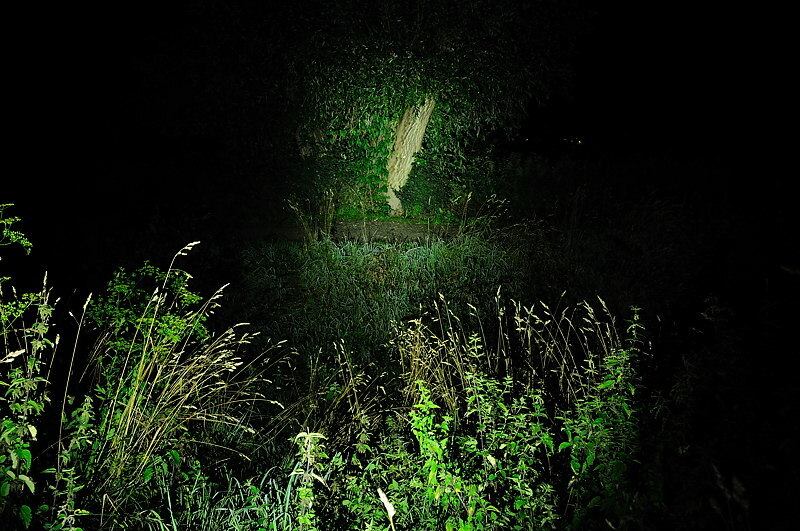 The light is delivered in a small white cardboard box with a window and selected specifications printed on the box. The box contains the light, a split ring, a spare o-ring and the manual. The head is smooth except for some groves. The actual light engine is mounted in a brass insert that also has the threads and o-ring. Using brass for threads gives a very good quality threads. 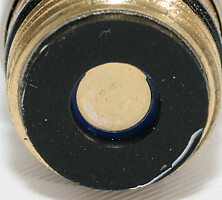 The battery connection in the head is surrounded by a black soft ring, this ring will reduce battery rattle and work as a mechanical polarity protection. This light does not use the standard ring on the circuit board for power connection and on/off, it looks like the switching is done by breaking the battery connection, both at the top and bottom. 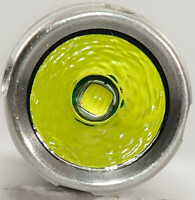 The inside of the battery tube, it also has a soft ring. There is no spring, but the connection has some flexibility. 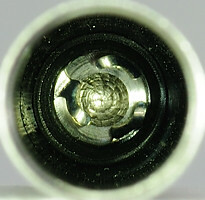 The backend of the light is made for use on a key chain (Use the supplied split ring between the key chain and the light). 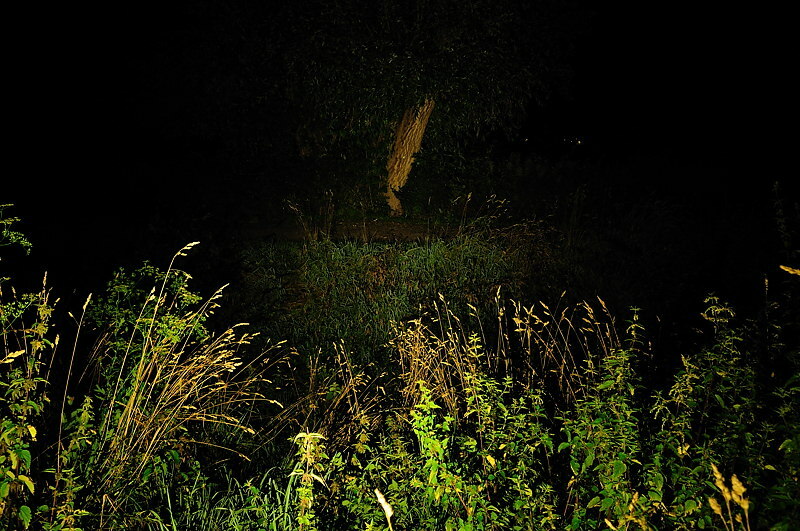 The light cannot tail stand. 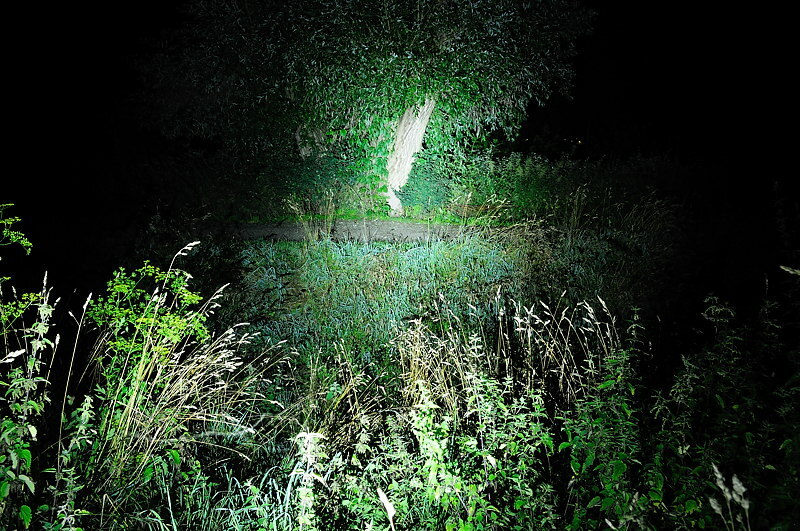 This light is a solid and well performing keychain light, the stainless steel secures that it can survive around keys. 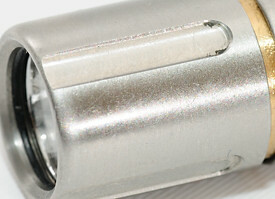 This light is designed for 1.5 volt AAA batteries (Alkaline, NiMH). In the above table I have used 800mAh eneloop batteries for measuring and estimating the runtime. 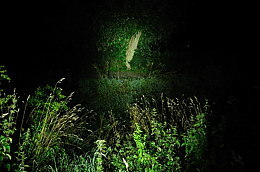 The estimated lumen are based on the specified 85 lumen and then scaled according to measured brightness. High will automatic be reduced after some minutes. 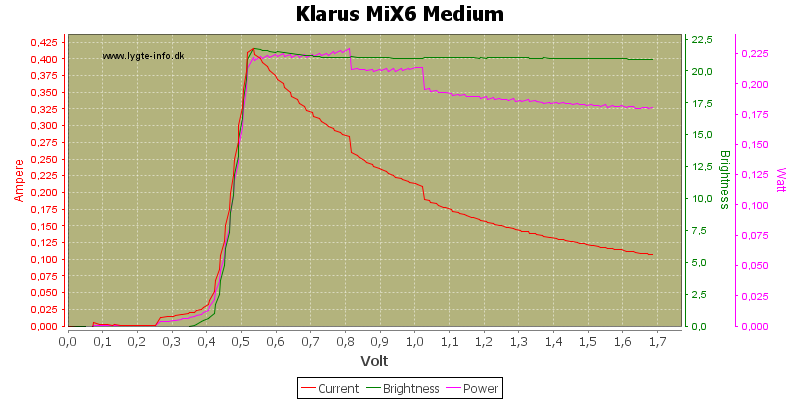 The voltage sweeps shows that the light does not have perfect stabilization on high, but a useable one. 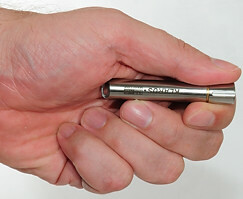 It can keep the brightness down to about 0.85 volt, where it draws 1.8 ampere. 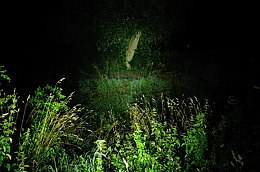 The light does automatic reduce the high brightness after a few minutes. 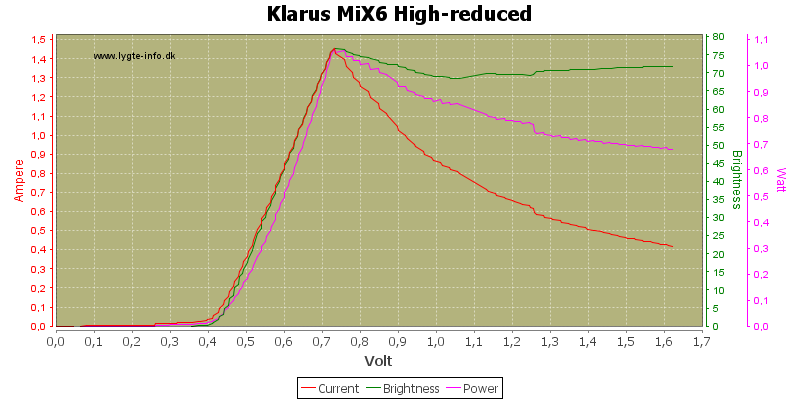 With the reduced brightness it has better stabilization, but it has a increase in brightness just before it drops out of regulation at 0.73 volt. At medium the light has a good stabilization down to about 0.55 volt. 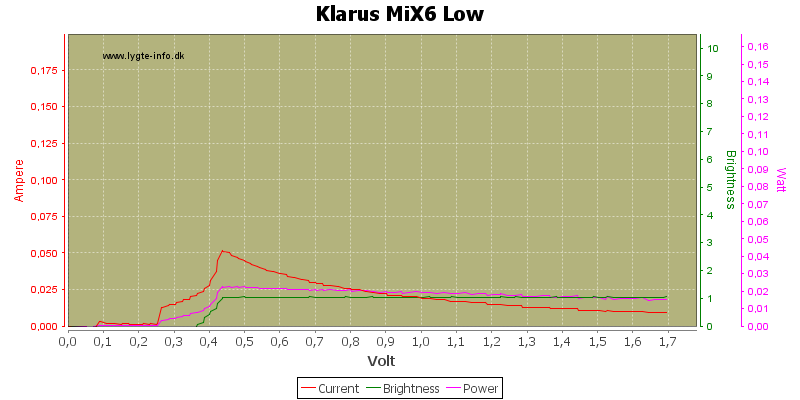 Low will stabilize down to 0.42 volt. Here I have zoomed in on the step down in high mode, it happens after 3 minutes and a few seconds. 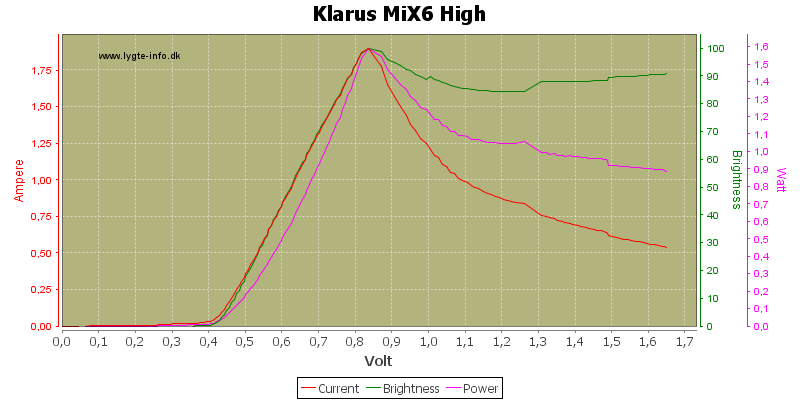 The strobe is about 8.8 Hz with 33% duty cycle. The strobe has some noise in it, exactly like high. Here I have zoomed in on the noise, it changes with voltage, but is way to fast to be visible.